The virtually antique 1/96th scale U.S.S. Kearsarge by Revell is a fascinating model of a fascinating ship dating back to the Civil War. A Mohican-class sloop-of-war commissioned in 1862, the ship is best known for its epic battle with the Confederate commerce raider C.S.S. Alabama, which it caught up with near Cherbourg off the coast of France in June 19, 1864, sinking the famous raider after a grueling hour-long duel where the Alabama’s deteriorating powder told against her. In addition, unbeknownst to the Alabama’s Captain Semmes, the Kearsarge a year earlier had steel plating applied to her hull on the gunwales to protect her steam engine and ammunition lockers. Consequently, even though the Alabama scored what might have been at least two fatal shots to the Kearsarge’s flank, the armor prevented the hits from penetrating. Eventually, the captain of the Alabama sent out a surrender as the raider was foundering, and the Kearsarge picked up the majority of her crew, although Semmes and 41 others escaped in a ship’s boat to spend their remaining wartime in England. Seventeen of the Kearsarge’s own crew received Medals of Honor for their parts in the battle. The U.S.S. 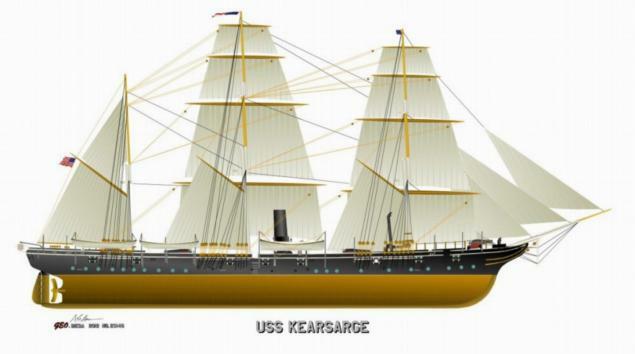 Kearsarge went on to serve the U.S. Navy for another thirty years before her wrecking off the coast of Nicaragua in 1894. Meantime, she traveled all over the world and served in many functions, including scientific expeditions and delivering emergency provisions to the victims of an earthquake in Peru. As a consequence, such a model should hold a special place in any collection of Maritime lore. However, unlike the sister ship in the Revell line, the Alabama, this model does not accurately reflect the Kearsarge as it was equipped at the time of her action during the American Civil War. In fact, the kit represents the ship as it was refitted around 1880, which drastically altered its appearance. This article is designed to show how I went about making it a more accurate wartime rendition of this fascinating vessel. First and foremost, let’s discuss the most radical changes. Due to experiences in combat, it was later decided to raise the gunwales substantially, protecting the crew more effectively from enemy shot during an engagement. They also increased the mast steps to mount three, rather than two spars on the main and mizzen. Other, more modest changes included increasing the number of ships boats from four to six and altering the armament. I’ll discuss each of these changes in turn. The areas marked in red in Figure 2 are the areas that are going to disappear in the remake of this classic kit. I’ll go into detail on each of these changes in the following sections. The most drastic change to the appearance of this vessel is going to be the reduction of the gunwales, or walls of the ship. This is actually easier than it looks, entailing the removal of the hull sides down to the top of the gun ports. Every picture or drawing I’ve seen of the Kearsarge from the Civil War show the guns run out through open-topped gun ports, so that’s what you’re aiming to replicate. You can use the projecting railing at the top of the gunwales as your guide and simply saw gently along this line all the way around the hull. For the most part, this will permit you to simply snap off the excess along the top. Once done with that process, you’ll also want to trim the railing off the gun ports as they should be open. The only place I encountered some difficulty was with the beak of the ship’s prow. You’ll want to take some care here, although with the thickness of the plastic you’ve got a lot of room for error, but you want to retain the lower line of this beak, which is pretty obvious if you’ve been using the guide along the flanks of the hull. You’ll find that you’ll have to do a bit of carving to remove some of the excess as well as the thick plastic around this area. This will leave you a large empty cavern at the prow where formerly there was a kind of cover over this which had the bowsprit sticking through. More on this later. There’ll be two additional changes to hull at this point. The smaller gun ports have their lower gun covers molded integrally with the hull. Since these are inappropriate for gun port covers that fold completely down, they’ll have to be ground off, which is not a terribly tough job with a Dremel. Besides, the new gun ports you fashion from sheet stock will cover any blemishes from this process. Secondly, you need to fill in the mounting holes for the two aft ship’s boat supports. Again, this should not pose any serious difficulty. By now you should note that the ship is becoming far more elegant in appearance than the kit version, looking very much like a deadly greyhound of the sea. The lowered gunwales make it look long and lean, which appeals to my artistic tastes, and this was the beginning of my real enjoyment with this modification. The most notable change here is that the raised foredeck should be shortened. In the 1880 configuration, it ran aft past the foremast almost to the first staircase leading down into the hull. In the older configuration, however, it stopped just short of the foremast. This is again not a difficult modification, although you’ll want to be careful here. By cutting down the gunwales, you also make this deck move toward the bow a bit. However, if you did the gunwales properly, the foredeck should just snug down inside the hull edges. You will have to re-configure of the various pin rails and tie-downs serving the foremast, as in the kit, these are all on the raised foredeck. Instead, I mounted a couple of them on the hull sides, put the pin rail furniture appropriately around the mast mounting on the main deck, and a tie-down rail on the upper deck in front of the foremast. This modification to the raised foredeck will also expose the previously-covered ship’s oven. In my case, I detailed this item with some bits of scrap and cut down the smokestack so it didn’t look quite so gawky, as it no longer has to run up through the upper decking. I talked earlier about the fact that the removal of the upper gunwales places the upper foredeck further forward on the hull, which means that the bowsprit, if properly installed, is now going to thrust up through the forward part of this deck. This simply means cutting an appropriate opening or slot in the front part of the foredeck to accommodate the bowsprit. I did mine by guess-and-by-golly and it came out looking remarkably good – very much as if it was intended. I added some simple plastic strip details to finish this part off. You may also want to come up with a suitable covering for that gaping hole in the ship’s beak at this point. Unfortunately, I couldn’t find any pictures of this part of the real ship, so used some common sense and made a kind of wooden “netting” which looks right and screens the raw inside of the plastic hull. Where would we be without Evergreen strips? Because of the removal of the upper gunwales, the bowsprit projects forward from the beak of the ship at a lower angle than the kit intended. Mostly, you’ll just want to cut off the square section of the main part of the bowsprit and trim the bowsprit back slightly so that it still sits correctly in a vertical position. The bowsprit itself should just rest on the top of the hull beak. Studies of wartime photos suggested that the structure was simpler than the rather complex 3-part kit item, so I made it into a simpler two-part item with the end being made of wood again for strength. These were distinctly different from the postwar armament, and the only real way I can suggest to get them right is using Cottage Industries’ wartime outfitting. Although these are a bit pricey, they really look the part, including the gentle flare of the bores on the Dahlgrens as well as the very different smaller deck guns. Be sure to wash the resin parts, though, as I didn’t and had some trouble with paint stripping off them when drybrushing. Although the casting of the gun barrels themselves was pretty good for the most part, I was less enthralled with the smaller gun carriages. These, also cast in metal, were a bit crude. However, they were of the appropriate four-wheel design unlike the two-wheeled kit gun carriages, so I was obliged to make do. For some reason, Cottage Industries failed to provide the gun tools with my set, although my C.S.S. Alabama set came with them. Consequently, I simply used that set as guides and made a second set for the Kearsarge from rod and other bits, including a couple of gun “worms” with some solder. These were understandably not included in the Alabama set, as they would have been prohibitively difficult to cast. The only part I felt obliged to totally replace was the lower support for the bowchaser gun, which was molded in a rough resin sandwich and basically unusable. This was easily fabricated from plastic strip and the rollers from one of the kit Dahlgrens. I made some runs for this gun on the upper foredeck by drawing a couple of circles on a piece of paper with a template, cutting them out with an X-Acto (and a steady hand), dying them with india ink and gluing them on with white glue. Because the wartime ship only had two spars on the fore and main masts, you lose a “step” on each of these masts. Fortunately, the mizzen mast remained the same so you don’t have to adapt this at all. To simplify this alteration and to strengthen these notoriously fragile parts, I decided to replace the upper portion of all three masts with wood. This also absolved me from having to fudge the plastic parts, which have various extrusions and indentations, all of which would have had to be removed or filled. Making these replacements simply involves some dowel, a power drill and a bit of sand paper. You chuck the dowel into your drill, crank her up and let the sandpaper do the dirty work. You can finish each piece with some fine grit to smooth the surface as well as gently taper the very tip, which tends to want to taper too abruptly when using this power drill method. Be sure to cut the dowel pieces long so you can dispose of the part that was in your drill head. 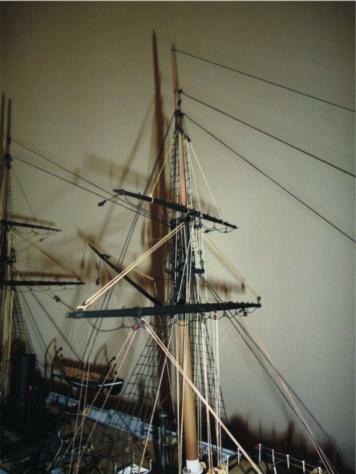 I studied numerous photos and drawings from the period, and it was pretty clear that the wartime version of this ship lacked the elaborate crow’s nest platforms of the latter refit, instead opting on all three masts for the simplified, open spar types that are depicted in the kit for the upper masts. This means having to scratch suitable items from strip styrene, which is well within the average modeler’s capabilities. I finished mine in about an hour, and they certainly look the part. By now I’d achieved most of the modifications necessary to complete this version, and from here on in it’s simply the process of finishing the model up, including the standing and running rigging. As always when building Revell sailing ship models, I replaced the plastic ratlines and deadeye rigging with the real thing, which makes the model look immensely better, in my opinion. The chain stays for the deadeyes were also far too heavy and thick, so I fabricated new ones from plastic strip as well. Again, nothing that should be beyond the average modeler’s capabilities. Of particular note is the paint scheme: The box art and several models and pictures from the internet depict this in the 1880 coloring, with white masts and ship’s boats. By studying the few pictures there are of the wartime configuration, I was able to determine that for the most part, the ship was virtually all black, including the ship’s boats. Only some bare wood sections of the masts break up the scheme much. The ship’s boats each featured a single narrow white stripe down their otherwise straight black scheme. Even the fairly simple trim work at the beak of the ship was painted straight black. This, as you can guess, was a very practical warship! As I proceeded to finish the model, I fabricated new gun doors from sheet plastic, new railings on the raised foredeck from pins, and other similar bits and pieces as needed – nothing too elaborate or demanding. The crow’s nests I’d fabricated earlier on the fore and main masts held up well to rigging, and there was more than one time I was glad that I’d replaced the more delicate sections of the masts and bowsprit with wood. It’s far too easy to smack them into something while turning the ship around to access some rigging spot. In fact one time I hit the bowsprit so hard that it jammed about an inch of it INTO the model. Amazingly, some delicate tugging restored it and its associated rigging without damage. Another little fun thing I did had to do with the spars. I’ve always had trouble getting the foot ropes to look right, so this time I made supports with wire (and a little eyelet bent at the end) and used fine solder for the footropes themselves, which permitted me to “sag” them realistically against their supports. One of the final things done was filling the portholes and deck structure windows with a little white glue to eliminate the see-through effect; a couple of little cloth flags from Bluejacket and I was done; another addition to my collection of Revell 1/96th classics. Looking back on the project, I think the only thing I might have done differently would have been to overlay the kit decking with carefully glued Evergreen strips. Despite meticulous attention to getting the three main sections aligned, there is still a noticeable step between these under certain lighting conditions. Oh well – guess I’ll give that approach a try on the Alabama!